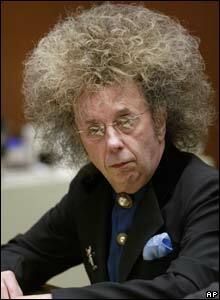 Born in New York in 1940, Phil Spector started his career as a musician before inventing the "Wall of Sound" recording technique and discovering girl group The Ronettes. By the mid-1960s, Spector was much in demand as a producer, working with The Righteous Brothers and contributing to The Rolling Stones' debut album. Spector was rarely pictured without his trademark dark sunglasses and made a brief cameo as a drug dealer in the film Easy Rider, in 1969. After spending some years out of the limelight, Spector produced Let It Be for The Beatles, which topped the UK and US album charts in 1970. Spector's most recent work came before his arrest and was with British band Starsailor. He was due to produce their entire 2003 album Silence Is Easy but was fired over creative differences. Lana Clarkson, best known for her role in 1985 cult film Barbarian Queen, was found dead with a gunshot wound to the mouth at Spector's home in 2003. 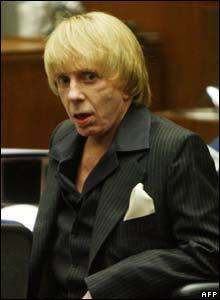 During his first trial Spector appeared in a series of bizarre guises, including wigs and platform shoes. The jury in the first trial in 2007 failed to reach a verdict after 12 days of deliberation. The retrial took five months. 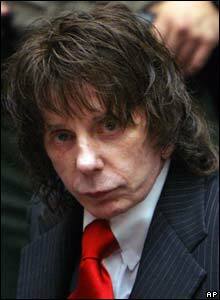 Spector sat motionless in court when the guilty verdict was read out. He will be 88 years old before he is eligible for parole.